The Brady Road Resource Management Facility opened in 1973 and will be in the shadows of our community for at least the next 100+ years. The only direction Brady is moving is further south of the Perimeter, cell by cell over time. I believe it is important that we are aware of the many ways the City is working to reduce the impact of landfill activities (i.e. landscaping, noise and odour control, construction, etc) on our community and local environment. There are many innovative and exciting pilot project occurring at Brady. Landfills are no longer large dumping grounds. The 2017 Annual Report on Brady’s operations provides excellent insight into the many aspects of waste management. 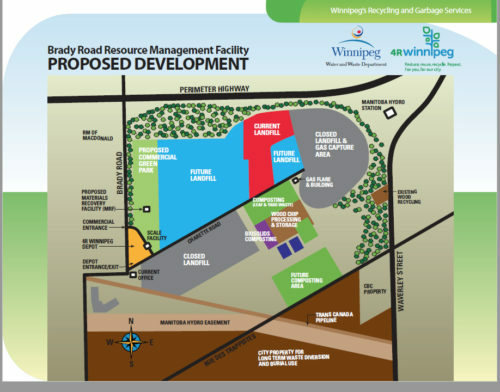 If you smell an odour that you think is emitting from the landfill, please email 311@winnipeg.ca or call 311. The staff at Brady respond within 24 hours during the week. They have specialized equipment and sensors located throughout the landfill that detect high concentrations of hydrogen sulphide, which causes foul odours. Their detectors are also able to identify the general location where the odour is coming from in the landfill. Staff do not monitor odours on weekends or in the evenings, but will follow up with any complaints the next business day. Odour monitoring is usually performed on Fridays, and if necessary, the disposal operation is adjusted accordingly to avoid any issues on the weekend. The Brady Resource Management Facility must follow Provincial operating legislation and is required to submit a list of odour complaints to the Province for their annual facility report. So if you complain –it will be reported and addressed. Note there were 13 odour complaints in 2017. I find that rather astounding. As of June 30th 2018, there were 8 complaints. I highly recommend if you smell an odour – to report to 311@winnipeg.ca. 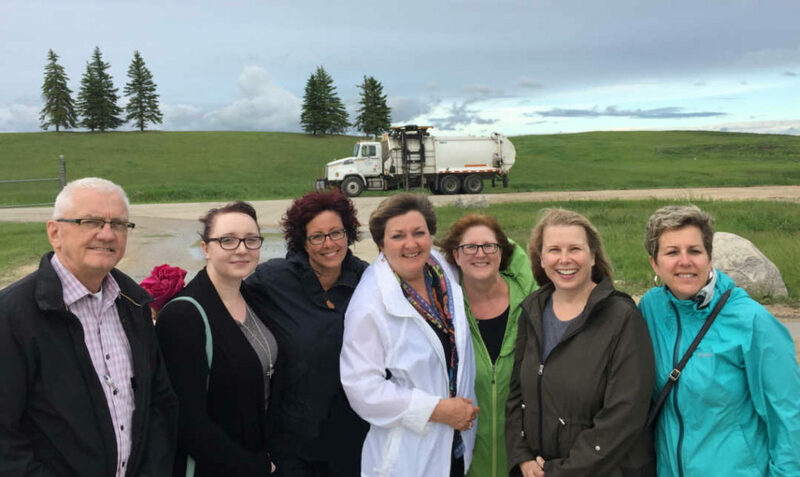 There are many activities occurring at the landfill and the more aware the staff is related to odour issues, the better they can learn what might be causing an odour and then adjust their disposal operations accordingly. It is inevitable that plastic garbage bags will blow around on windy days and land in locations other than the landfill. For any garbage that needs cleaning up, please contact 311@winnipeg.ca There are teams of people who regularly clean along the South Perimeter and along Kenaston. It is important to call 311 to put in the request. 3. Is Brady Closing or Moving? Brady was opened in 1973 (45 years ago) and is anticipate to last between 100-150 years. The good news is – Brady will be expanding further south from the Perimeter in the coming years, and the entire ‘front facing mound’ is being landscaped and covered in native prairie grasses. 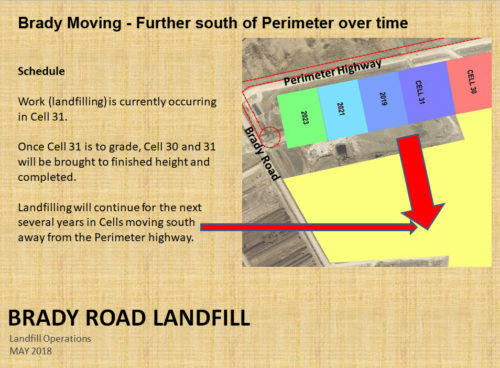 See the image that show where the ‘garbage cells’ are located and the estimated time frame to be covered.